Natarani and Sasha are a husband and wife team who have become an accomplished professional musical duo called ‘Heartstrings’ over the last twelve years. 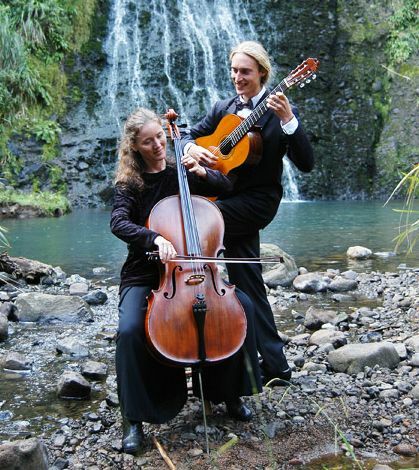 They performed their first concert together at the Pumphouse, Takapuna in 1999 went on to establish the Heartstrings classical duo in 2001 and were married a year later. Heartstrings perform for weddings, concerts, funerals, festivals and corporate functions. They also teach music in schools and personal tuition from their music studio in West Auckland. Natarani and Sasha were appointed Waitakere ‘Cultural Ambassadors of Music’ by the Mayor Bob Harvey to recognise their dedicated contribution to enriching the cultural life of the people in Waitakere City. Natarani holds a Master of Music Degree in cello and a Postgraduate Certificate from Trinity College London. She is a certified Suzuki teacher and has played in a wide range of musical groups and orchestras including Waitakere Orchestra. Sasha completed his Diploma of Music at Auckland University and has studied with classical guitar masters in Venezuela and Canada. He has been performing as a solo artist for ten years. Sasha has also produced a C.D. of his original songs. Heartstrings perform for weddings, concerts and corporate functions. They teach music in schools as well as personal tuition at their music studio in Titirangi.